Would you make a good respiratory therapist? Take our career test to find out how you match with this and over 800 other careers. What is the workplace of a Respiratory Therapist like? 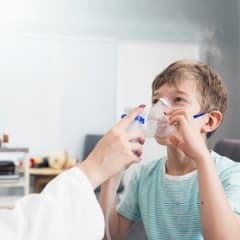 A respiratory therapist is someone who cares for patients that have trouble breathing; for example, from a chronic respiratory disease, such as asthma or emphysema. They also provide emergency care to patients suffering from heart attacks, stroke, drowning, or shock. Most respiratory therapists work in hospitals. Others may work in nursing care facilities or travel to patients’ homes. Respiratory therapists use various tests to evaluate patients. For example, they test lung capacity by having patients breathe into an instrument that measures the volume and flow of oxygen when they inhale and exhale. They may also take blood samples and use a blood gas analyzer to test the oxygen and carbon dioxide levels present. Respiratory therapists perform chest physiotherapy on patients to remove mucus from their lungs and make it easier for them to breathe. Removing mucus is necessary for patients suffering from lung diseases, such as cystic fibrosis, and involves the therapist vibrating the patient’s rib cage, often by tapping the patient’s chest and encouraging him or her to cough. Respiratory therapists may connect patients who cannot breathe on their own to ventilators to deliver oxygen to the lungs. They insert a tube into the patient’s windpipe (trachea) and connect the tube to ventilator equipment. They set and monitor the equipment to ensure that the patient is receiving the correct amount of oxygen at the correct rate. Respiratory therapists who work in home care teach patients and their families to use ventilators and other life-support systems in their homes. During these visits, they may inspect and clean equipment, check the home for environmental hazards, and ensure that patients know how to use their medications. Therapists also make emergency home visits when necessary. In some hospitals, respiratory therapists are involved in related areas, such as counselling people on how to stop smoking and diagnosing breathing problems for people with sleep apnea. Are you suited to be a respiratory therapist? Respiratory therapists have distinct personalities. They tend to be social individuals, which means they’re kind, generous, cooperative, patient, caring, helpful, empathetic, tactful, and friendly. They excel at socializing, helping others, and teaching. Some of them are also investigative, meaning they’re intellectual, introspective, and inquisitive. Does this sound like you? Take our free career test to find out if becoming a respiratory therapist is right for you. Most respiratory therapists work in hospitals. Others may work in nursing care facilities or travel to patients’ homes. They are on their feet for long periods and may need to lift or turn disabled patients. Like other healthcare workers, they may be exposed to infectious diseases. Most respiratory therapists work full time. Because they may work in medical facilities such as hospitals that are always open, some work evening, night, or weekend hours.